Rewind to 2005 and I'm checking out this week long festival in Barcelona called La Merce. I went to a series of shows at The Forum outside the Barrio Gottico and I was excited because Saul Williams was set to perform. There were something like 6 shows going on at the same time. I never heard of Cannibal Ox before this show, but I scribbled the thought on my mental post-its to check them out later. To me, if music reminds you of a specific point in your life, it's usually for a good reason. When I saw them in the show, I honestly left because the sound system was so messed up that all I could hear was treble. Now realizing now the offense that the soundmen committed, I know that you will have lot of better introduction to Cannibal Ox over the internet then I did in person. Or if you have already heard this album, just consider this an opportunity to listen to them again. RJD2's remix of The F Word is probably the best intro you can have though. Music that makes me think or escorts me into a different world is the music that I fill my days with. Not all of my music is dark, but there are plenty of dark albums in my library. 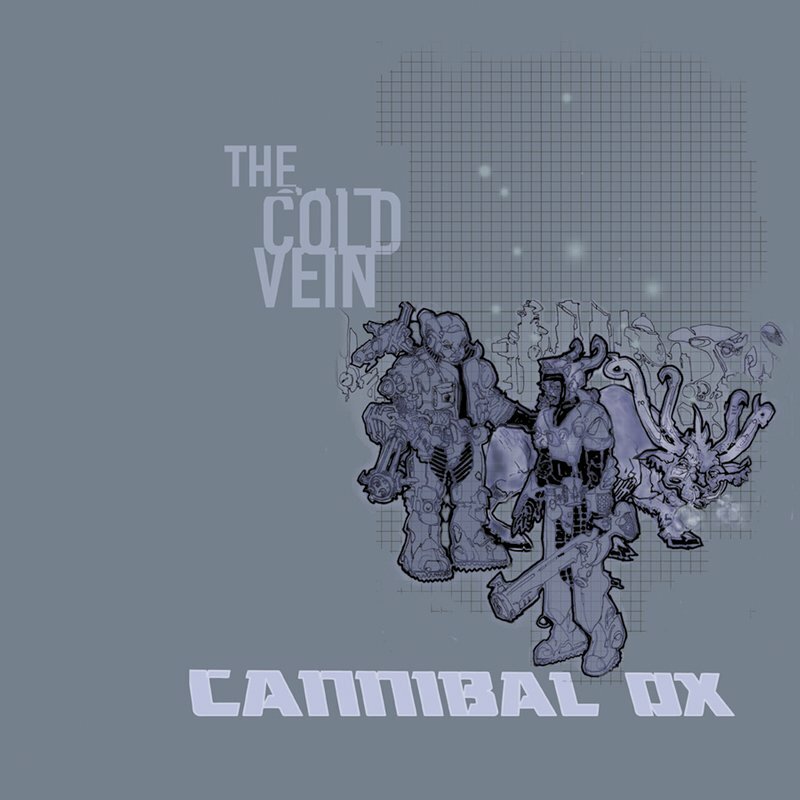 The Cold Vein is the only fully digested album I heard from Cannibal Ox, but it's a classic. I always wanted to see more work from them, but it never happened. The Cold Vein is a comic book-like dark collection of Def Jux tracks released in 2001. If you don't know El-P, this album shows his talent as a producer while Vast Aire and Vordul Mega hold their own lyrically. The Cold Vein was the first album released on El-P's newly formed Def(initive) Jux record label whose members include Del The Funkee Homosapien, Aesop Rock Cage, Rob Sonic and El-P among others. The Cold Vein is another example how record sales can sometimes only show how many people are compelled by hype toward mediocre albums with a few solid singles. Without a doubt, this album is one of the best albums from 2000 to 2010. Albums like The Cold Vein are the reason that I began writing about hip hop in the first place. Regardless of how you listen to music (mp3, cd, tape, etc), it's always nice to have an outlet that would rather say nothing than use filler get boywithstick.com's hits up. Iron Galaxy, Ox Out the Cage, Atom, A B-Boys Alpha, Raspberry Fields, Vein, The F-Word, Stress Rap, Real Earth, Ridiculoid, Painkillers, Pigeon and Scream Phoenix.